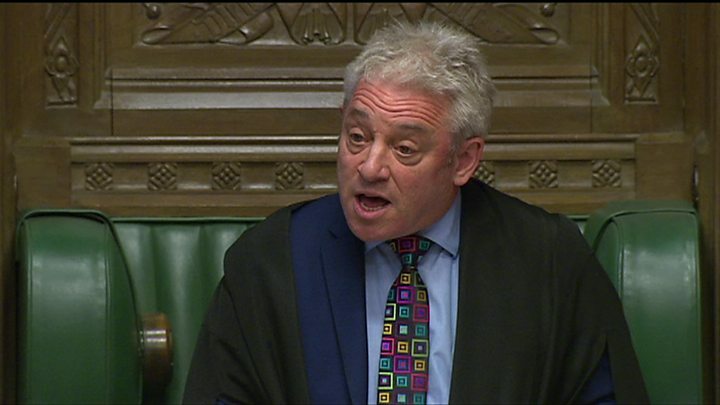 Speaker John Bercow has thrown the UK’s Brexit plans into further confusion by ruling out another vote on the PM’s deal unless MPs are given a new motion. In a surprise ruling, he said he would not allow a third “meaningful vote” in the coming days on “substantially the same” motion as MPs rejected last week. With 11 days to go before the UK is due to leave the EU, ministers have warned of a looming “constitutional crisis”. The UK is currently due to leave the EU on 29 March. Theresa May has negotiated the withdrawal deal with the EU but it must also be agreed by MPs. They have voted against it twice, and the government has been considering a third attempt to get it through Parliament. Mr Bercow cited a convention dating back to 1604 that a defeated motion could not be brought back in the same form during the course of a parliamentary session. He said the second vote on the prime minister’s deal last week was “in order” as it was substantially different to the first, but any further votes must pass the “test” he set out to be allowed. The BBC’s political editor Laura Kuenssberg said the speaker’s intervention does not stop Brexit from happening, but it makes it “extremely unlikely” that the government will put another vote on the deal to Parliament this week. This is turn makes it more likely there will be a longer delay to Brexit, she added. Mr Bercow’s statement appeared to take Downing Street by surprise, with the prime minister’s official spokesman saying it had not been warned of its contents “or indeed the fact that he was making one”. Later, a Number 10 spokesman said the statement had been noted and required “proper consideration”. The role of the speaker, who is the highest authority of the House of Commons, includes controlling debates, calling MPs to speak and choosing which amendments can be debated. How can the government get another vote on Theresa May’s deal? Well, first of all, rules are there to be changed. If MPs suspend or change the “standing orders” of Parliament, they could get the Brexit deal back on the agenda. Secondly, the government could change the proposition on offer. The former Attorney General Dominic Grieve has suggested that something “substantially” different would be to ask Parliament to vote for the deal subject to a referendum. If MPs can’t discuss the same thing in the same session of Parliament, why not simply start a new one? Read Iain’s complete analysis here. What’s the current state of play? The prime minister had been expected to submit her Brexit deal for MPs to vote on for a third time this week – a week after they rejected it by 149 votes – and ahead of the EU summit on Thursday. Last week MPs also voted in favour of ruling out leaving the EU without a deal, and in favour of extending the Brexit process – though an extension would have to be agreed by all 27 EU member states. Brexit minister Kwasi Kwarteng has confirmed Mrs May will be writing to European Council President Donald Tusk to ask to postpone the UK’s exit date. If the EU agreed, the government would ask both Houses of Parliament to approve the change, he said. Mr Kwarteng said the length of the extension would depend on “whether the meaningful vote goes through or not”. “If we have a deal… we will ask for a short extension,” he said. European leaders are expected to discuss a UK request to extend the Brexit process and delay the UK’s departure at the summit on Thursday. Shadow Brexit minister Matthew Pennycook said the fact that Article 50 needed to be extended was “a mark of this government’s failure”. Meanwhile, the government has been trying to convince the DUP and Tory Brexiteers, who have both voiced concerns about the backstop – the controversial arrangement to prevent physical checks on the border between Northern Ireland and the Republic of Ireland – to vote in favour of the deal. The DUP has opposed the deal up to now and are seeking further “clarifications” on the government’s legal advice about the Irish border backstop in the deal, and how the UK could exit it. What’s been the reaction to the speaker’s intervention? Ministers and MPs supportive of Mrs May’s deal expressed anger at the timing of Mr Bercow’s intervention. Conservative MP James Gray, who plans to vote for the deal after rejecting it twice, said he was “absolutely furious”; while fellow Tory Greg Hands suggested Mr Bercow was the only person in the country who was “accountable to nobody”. Solicitor General Robert Buckland warned there was now a “constitutional crisis” and suggested the onus was on the EU to come up with “new solutions” to enable MPs to vote on the deal again. “Frankly we could have done without this but it is something we are going to have to deal with,” he said. He suggested “there were ways around this” – including potentially cutting short the current session of Parliament, a move which would lead to calls for a general election. Opponents of the PM’s Brexit deal welcomed the Speaker’s ruling. Conservative former cabinet minister Owen Paterson said it was a “game-changer” and would “concentrate minds” ahead of Thursday’s EU summit. Sir Bill Cash, chairman of the European Scrutiny Committee, said it seemed to make an “enormous amount of sense” given that the Brexit deal has been defeated twice and there would need to be a “substantial difference” to allow a third vote. But the SNP’s Westminster leader Ian Blackford suggested there was now a “constitutional crisis” and he suggested the prime minister should “immediately” call a meeting of opposition leaders. The EU’s official position is that they are waiting for Theresa May to come to a summit in Brussels on Thursday with a clear statement about how she plans to proceed, and there definitely won’t be any more negotiations when she gets here. Unofficially, EU officials wonder if the government can get itself out of this situation, either with Parliamentary wizardry or by coming up with UK-only additions to the package, such as new guarantees about the role of Northern Ireland’s Stormont Assembly in the future. And could the joint UK/EU decision about an extension to the Brexit process, due to be taken on Thursday, be appended to the deal and then count as something new enough to justify another vote in the Commons? But explain to diplomats that the solution might be the Queen closing Parliament and re-opening a new session with a speech and their reactions are priceless.